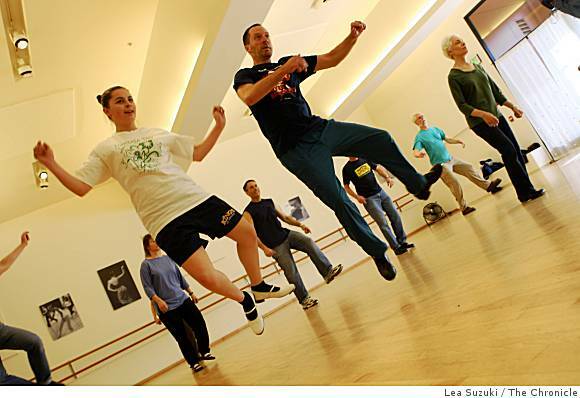 Ian Enriquez , our executive director, teaches clogging on Monday evenings in San Francisco! Congratulations to Neil Dessecker and Danielle Metzler-- winners of a free month of dance classes for August from FunCheapSF! The Barbary Coast Cloggers are looking for cloggers with previous performing experience. We're looking for men with talent, energy, great stage presence and an ability to work (and play) well with others. We offer exciting high-profile performance venues and a rowdy good time! Interested? Barbary Coast Cloggers featured in the San Francisco Chronicle on May 30, 2005. Check out more quotes and reviews on the BCC! Clog Rush Fever Hits Northern California! Free Show On-Line from North Carolina! Clogging Takes a Bite Out of the Big Apple! As the first high notes of fiddle fill the air, a group of twelve men in jeans and flannel shirts begin to clap rhythmically. 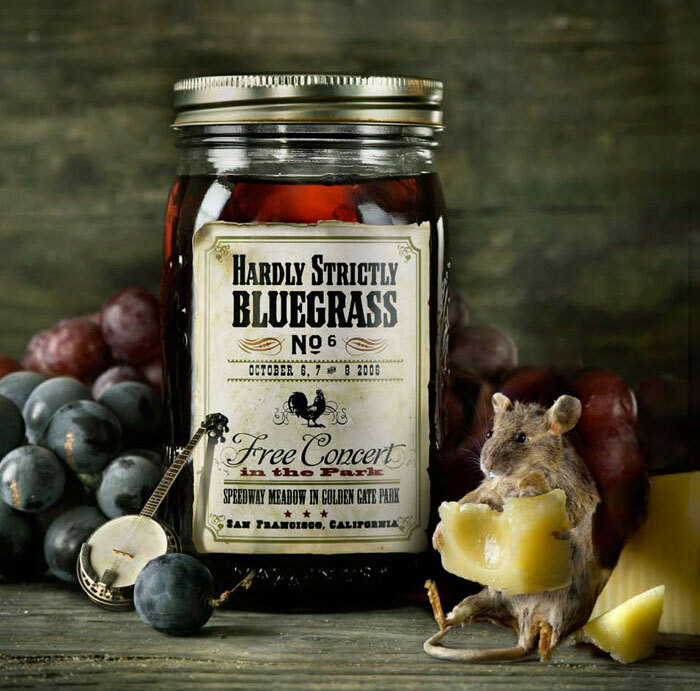 A banjo joins the fiddle, and the men are off—stomping out a strong beat against the wooden floor, their toes and heels hitting the boards in a driving thump-clackity-thump as legs fly merrily. These are the Barbary Coast Cloggers, an all-male clogging ensemble known for their energetic and upbeat performances. If you went to the Warfield on Tuesday night to see Faith No More, you got to see a legend who hasn’t lost a step and a San Francisco institution blow the crowd away. While billed as Faith No More concerts, this three-night Warfield run is playing more like a San Francisco vaudeville show, as befits the history of the Market Street theater. For tonight’s performance, the reunited band invited comedian/performance artist Neil Hamburger, Jello Biafra & the Guantanamo School of Medicine, and the Barbary Coast Cloggers to join them. And what a combination this was. For the entire article, click on over to Spinning Platters! 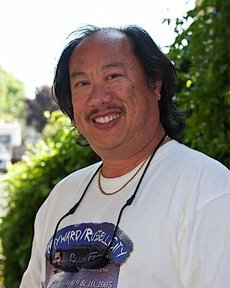 Northern California lost a terrific clogger and friend today. I first met Doug Chin about 1979. He was just 19 or 20 years old and eager to do as much clogging as he could. That’s one thing about him that never changed, his love of clogging. We shared an interest in photography and he also loved cooking. Doug always had a smile on his face and was too busy having fun to ever be unkind to anyone. He supported all the clogging events in Northern California and surrounding areas whenever he could and was always on the dance floor until the very end. Doug danced first with the Young Rebels in Oakland, then also with the Diablo Mountain Cloggers, the Blossom Hill Cloggers, Hillbilly Cloggers, and the Barbary Coast Cloggers. He’s left behind many friends who are in shock. He had just performed with the Barbary Coast Cloggers at the San Francisco Ethnic Dance Festival in June and celebrated his 50th birthday. Thanks for your smile and friendship, Doug. You will be missed. Afternoon sunlight pours through the windows of ODC's Shotwell studios as Ian Enriquez's clogging class thunders away in the first-floor studio. Sweating and intently focused, the dozen or so dancers track his moves and repeat them. Any misstep will be plainly heard, but the class - which is peppered with students from all age groups - pounds gamely away at the wooden floor to the not-exactly bluegrass strains of "Let's Hear It for the Boy." Clad simply in jeans and a blue T-shirt, Enriquez shouts instructions amid this racket via a Janet Jackson-style headset. "Triple brush, Utah ... turning Utah ... donkey ... McNamara..." The dancers dip and bob, hands floating in the air as they keep the rhythm going, "Triple toe ... double pull ..."
Although it sounds less like a dance style and more like something you call a plumber for, clogging enjoys an enthusiastic following, with thousands of dancers participating in more than 600 clubs across the United States. 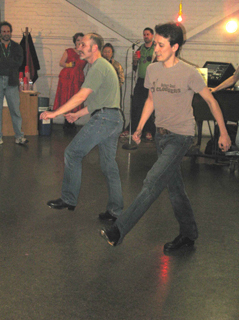 With roots in Irish and English folk dancing and some similarities to tap dance, American clogging is an amalgam of European, Cherokee and African influences, all of which converged in the Appalachians where clogging first sprang up as a social dance primarily accompanied by bluegrass music. Jeans and T-shirts are the dance clothes of choice, but the students are quick to note that clogging doesn't require special gear or costumes or even shoes. Most of the students seem to be in comfortable footwear to which they've glued the double taps that give clogging its distinctive ring. Another student has taps attached to a pair of sneakers. "Clogging tends to attract people in their 30s and 40s," says Enriquez, who also directs the Barbary Coast Cloggers, a professional, all-male group that is scheduled to perform at the San Francisco Ethnic Dance Festival in June. "It's definitely a devoted group. We have people who've been coming to the class for years, who have become hard-core dancers. We try to make everyone feel welcome." The guys who perform in the Barbary Coast Cloggers ensemble, Enriquez says, have a wide range of day jobs: therapists, school principals, vice presidents of ad agencies, even police officers. For some of the students, getting the chance to be in the company is the incentive, but for others, just being able to dance is the point. Berkeley psychologist Donald McKillop says that clogging is just the sort of right-brained activity he needed to balance out his left-brained academic tendencies. Even though it's been a particular challenge, he says, "One thing that keeps your brain from going south as we age is to do things on your nondominant side. And it's also a lesson in humility." McKillop credits dancing with helping him through the difficult breakup of a long-term relationship. "When I finally got the courage to end it, I was facing a pretty bleak social future. Being single is hard, but being old and single is particularly hard. But I have not only had the joy of dancing and improving my dancing, I've met people who are very genuine and caring. There's always something to talk about and something to do together. As you can tell, dancing has been a godsend to me during this tough time in my life." During the break, folks are trying out new steps while chatting companionably. The class has moved onto specialized work for the advanced dancers, and the music - which, in Enriquez's class, is as likely to be Rihanna or Gwen Stefani as bluegrass - blares out from the stereo. There's a whiff of hip-hop about Enriquez's brand of clogging, and students are bobbing their heads as they watch their more advanced compatriots work on a complicated sequence. "It inspires us to hope we'll get good enough to perform," says Ming-Lun Ho, who took up dance as a graduate student at Berkeley. Now on the math faculty at Chabot College, Ho recalls nervously walking hallways and tapping and kicking before exams, and he realized that there could be an outlet for those noisy feet. "I like to play percussion with my feet; I like the rhythm, the mathematical logic." Jeff Porter, who has danced with the Barbary Coast Cloggers, says that clogging, with its vocabulary of thousands of steps, can look daunting. "I first saw cloggers at the Stompede at the Sundance Saloon," he continues dryly. "It didn't look like anything I could do." But Porter, who was already doing other forms of folk dancing, started taking classes just so he could have an extra night of dancing. "The more I did it, the more fun it became. At first, it was strictly recreational, but as it became more challenging, I found this real love for it, a passion for pursuing it." Thunderous rhythmic rolls echo through the building as a dozen dancers stomp enthusiastically on the wooden floor. Enriquez pauses to give a few steps, and although it's in English, it might as well be wartime code. "Four crazy legs and two turkeys ... a long pigeon." Cloggers have cue sheets, but for the classes, the students don't read the sequences, they memorize them piece by piece and perform the steps as the "cuer" calls them. "Burton Joey, Rock Burton, Rock Burton, Burton Joey ..." Enriquez says in a sort of mysterious haiku. "Called dances like clogging really take concentration," says Porter. "You have to be in the moment, you can't be thinking about laundry or groceries." "It's just so joyous. It is just such fun to express yourself with your body - and, after a while, the body just knows what to do without the intervention of the brain." To see video of the clogging class in action, go to sfgate.com/video. Performing Arts for Youth is an organization serving the San Mateo Unified School District to provide quality educational performance arts to youth. It was our honor to perform alongside Sidesaddle, as part of their Spring 2007 line-up and quickly sold out nearly 3,000 seats. The educational performance taught about bluegrass music, instruments, juba dance, the history and ethnography of clogging, and even brought up some daring kids to try some steps and formations. The performance was accompanied by lesson plans for levels K-8 and is available for download through their website (click title above). Congratulations to Cheyenne Danner, winner of Quest for the Best SF 2007. In competetion against tap dancers, hip hop dancers, singers, bands, and classical instrumentalists, Cheyenne rose to the top to win $1,000 after a flawless performance of Cindy taught to her by Matt Ellinger! 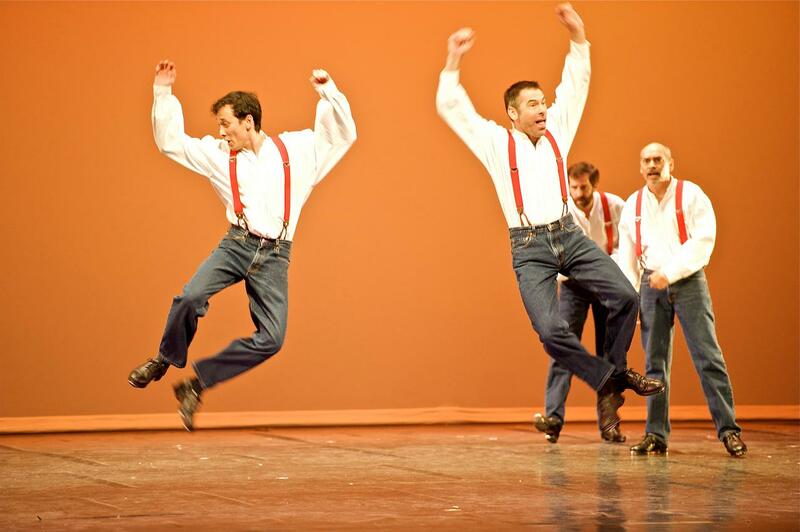 Brian Wines and Ian Enriquez of The Barbary Coast Cloggers were instant crowd pleasers at the Jon Sims Center. The Jon Sims Center for the Arts held its “Second Debut: A Re-Grand Opening Celebration” at JSC on St. Patrick’s Day evening. Displayed on the walls were framed photos of Jon Sims, founder and conductor of the Gay Freedom Day Marching Band, who died from AIDS in 1984, as well as his famous baton in a glass case. In studio one we got to hear all about clogging and get a demonstration with several very intricate, fast-paced exhibitions (such as the “Red Rose Reel” and a clogging/square dancing bit to “Foggy Mountain Breakdown”) by the Barbary Coast Cloggers, who have been around for 26 years. They taught us some basic clogging steps, like the shuffle, brush, and rock-back. My favorite was the slap leather step, but when it all got too complicated, this reporter found himself to be one clumsy clogger. We learned that this dance form is a combination of African, Irish, Scottish, German, and American traditions, and that tap dancing evolved from clogging. The Barbary Coast Cloggers hold clogging lessons for beginners to advanced categories at JSC (1519 Mission and 11th Streets) Monday nights. For more info check out barbarycoast.org or call (415) 552-4541. It’s a better workout than jazzercise or aerobics. The Barbary Coast Cloggers could not have survived 25 years if it were not for our loyal fans who catch us at our annual events. Frances Strubel is one of those fans who came each year to the Harvest Festivals and caught several shows each time. A couple of months ago, I got a call from her loving son-in-law, who asked if we were available to perform at Greenridge Senior Care in El Sobrante because Frances has not been able to see us perform in a while. It has been a while since we have been able to do such an intimate performance so a couple of us jumped at the opportunity. It was not going to be a big performance space so we were limited to four dancers. There have not been many dances that we have performed as a quartet so we looked at what we had and did reworked it so we could perform as long a show as possible, but we were able to perform 5 numbers. I must say, it turned out to be such a blast. There were even a few outside guests who heard about the performance and stopped in. The residents and staff were wonderfully accomodating during our visit and everyone enjoyed the show as much as we did. Thanks to everyone who made it happen! On December 3rd, 2006 the Richmond-Ermet Foundation held the 8th Help is on the Way benefit concert which included a "historical" performance by Nancy Sinatra and the Barbary Coast Cloggers! We will admit that we were apprehensive, dancing in Santa outfits to choreography we had learned only one day before is a new experience for us. Lee Martino, a choreographer from Los Angeles, came up to stage our routine and she was incredibly fun for all of us to work with and we miss her so much already! Personally, this was my first choreography to be performed by the group and it was a blessing to collaborate with someone so gracious and fabulous. We came out second on the shows line-up to perform two of our standard favorites, Fisher's Hornpipe/Devil's Dream and Foggy Mountain Breakdown. We returned before the all-star White Christmas finalé dressed in Santa suits in the middle of Nancy Sinatra singing These Boots are Made for Walkin' to throw treats out into the audience. As the third verse began, we danced along and were blown away by the most overwhelming audience response we had ever seen! It had not crossed our minds that we had not been recognized until the audience went wild about the clogging Santas. We were on cloud nine for the rest of the evening. The gratitude was abundant to all who made the event possible. Barbary Coast Cloggers were honored to appear at the Sixth Annual Hardly Strictly Bluegrass Festival in Golden Gate Park, October 7, 2006. The three day event was attended by as many as 500,000 people, catching top bluegrass, country, and American roots music acts on five stages. We were booked on the Banjo Stage (main stage) performing just before Earl Scruggs. During our set, members from Scruggs' band sat onstage, watching as we danced to their Foggy Mountain Breakdown. "Ya done real good. Keep working hard," Scruggs said after our set. The afternoon was bright and sunny and the crowd responded loudly to our bell kicks, stomps, and chugs. Our set opened with ten of us performing to I'm Ready to Go, swiftly followed by eight more numbers, including our a'cappella Hambone, a brisk Orange Blossom Special with two four-man squares, and an all-out rowdy Rocky Top to end the show. What a privilege to participate in such a tremendous event on our own home turf! Mayor Newsom comes to the Barbary Coast! Photo taken at the 1906 Great Earthquake & Fire Expo, courtesy of Pat Johnson. There is truly no experience greater for the Barbary Coast Cloggers than to celebrate dance at the San Francisco Ethnic Dance Festival. Not only do we get to share what we do with a fantastic audience at the Palace of Fine Arts, we get to experience it with a diverse group of people who share our passions. This is what American cultural experience is all about and it is something that lies in the true essence of clogging. Clogging began as immigrants from around the world got together and shared each others dances, jumping in the middle of a room and sharing their culture while in return experimenting with the music and movements of the other groups there. It was truly such a pleasure backstage to work with the Tahitian group Te Mana o Te Ra as they played the dramas and taught all the other dancers how to move in their style. These moves could not be further away from the movement vocabulary of the cloggers, yet we did it. Most importantly we participated in the very tradition that gave birth to clogging in the first place. The Dunsmuir Scottish Dancers were also very eager to learn how to clog, so Brian Wines stepped up to the plate and shared what we do with them and we are looking forward to continuing this exchange with them once their performance schedule allows them to come sneak in to our Monday night classes. The great thing about this year’s Ethnic Dance Festival is the effort they put in to designing transitions between each performance group. It gave many of the groups an opportunity to briefly connect and exchange with another culture on stage. This spirit also carried on at the end of the show as the various dancers paraded out to the main lobby to celebrate with each other and the audiences. Several of the bands performed there as various dancers pulled audience members into the circle. The Scottish and Tahitian dancers continued to show their great spirit as they joined in at every opportunity. It was an unexpected treat to watch the Kalanjali Indian dancers jump in with Sidesaddle’s bluegrass music and do their thing. It was a truly magical weekend and we would love to thank everyone involved who shared in this incredible experience. To love, to life, to dance! With all that said, two of our dancers have decided to hang up their clogging shoes for the time being and pursue other ventures in their life. Dale Petros and Scott Terry have both decided to move on for now, but we certainly hope that their paths will find its way back to us in the future. Best wishes to both of you and know that you are always welcome here with us.